This Museum wins on so many levels it's not funny. 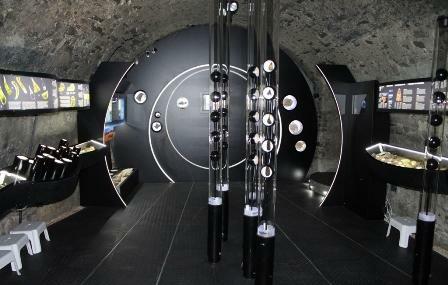 Visitors are usually surprised to find such a progressive scientific exhibit in a city renowned most for its history. What they don't know is that the exhibit here is of a phenomenon unique to Southern Bohemia. Millions of years ago, when a meteorite hit the earth here, it created a sort of precious stone known as moldavite. These stones are found nowhere else in the world. In 2005, it was decided that the creation of this gemstone needed to be explained to the people and so this Museum was born. Using a type of learning method called edutainment the Museum's movies and interactive displays guide you through the discovery and science. The thousands and thousands of specimens of moldavite beautifully arranged and lit up have made this CeskyKrumlov favorite. You can buy moldavite jewelry from the shop. People normally club together Kaplanka and Krumlov Mill while planning their visit to Muzeumvltavinu. Museum actually looks like a small house, but if you’re interested about “Moldavite”, still could come visit this secret place, I bought a beautiful moldavite here, also add very nice memories in my mind. I only went because admission was included in staying at the hotel upstairs. It’s a very small museum with surprisingly well done audio visual displays and a movie. You can probably be done in 20 min or less. Moldavite is a type of “gem” created 50 million years ago when a meteorite struck the Bohemia region. There are interesting Moldavite jewelry and gifts you can buy at the gift shop/hotel reception which I think is the main point of this establishment.